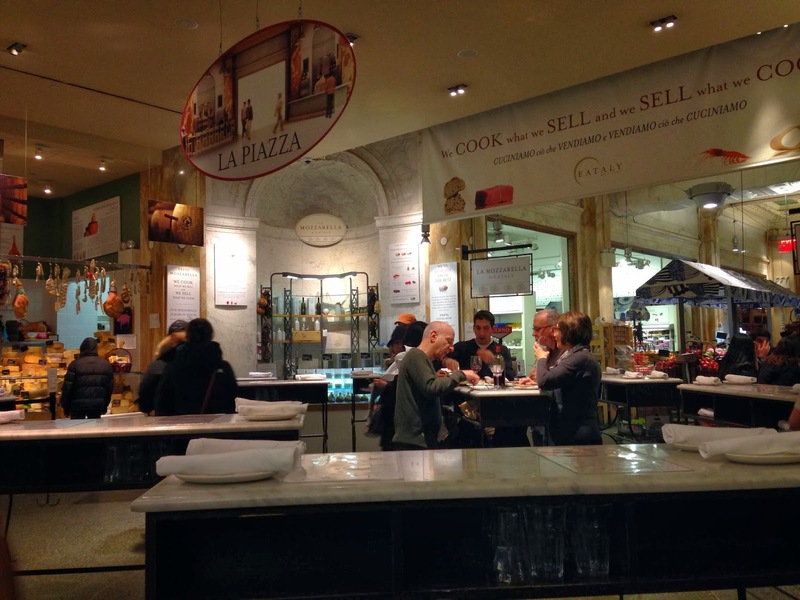 Eataly, an Italian marketplace complete with superbly fresh pastas and all the authentic Italian foods one could imagine, is one of my favorite places in NYC. When I used to work across the street from here, I would visit at least a few times a month, either to buy the fresh gnocchi and tagliatelle, or their wonderful in-house made mozzarella. Birreria, the beer garden on the top floor is also quite fun. With a retractable skylight roof, it's perfect for year-round dining and drinking. This past Sunday, the bf and I were in the Flatiron to pick up a few things at Home Depot when we decided to drop in to nearby Eataly. I love browsing at grocery stores, so even though I wasn't looking for anything in particular, I was excited to just peruse. We walked by La Piazza, one of the casual dining establishments inside, where there is a simple menu of wines, beers, and appetizers. We were lucky enough to grab seats at the bar, and by 12:45pm, all the standing room and bar seating had been taken. Make sure to go early to avoid crowds! It's also much worse on weekdays. Standing area where the same menu is served. I loved the salmon. It was so fresh and tasty on its own, and the sea salt crystals added the perfect touch. 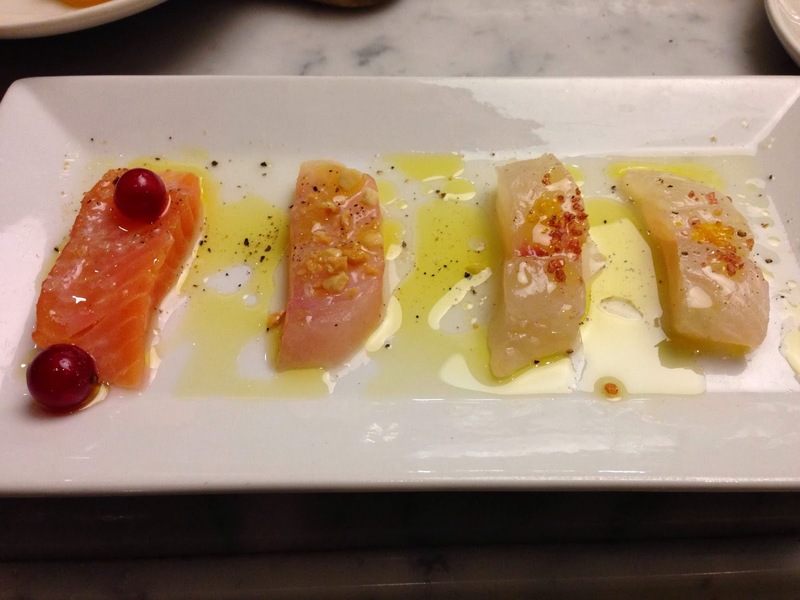 The amberjack was also delightful, while the fluke was slightly stringy and more forgettable. This assortment of cheese and salumi was terrific. Every couple sitting at the bar next to us ordered it as well. 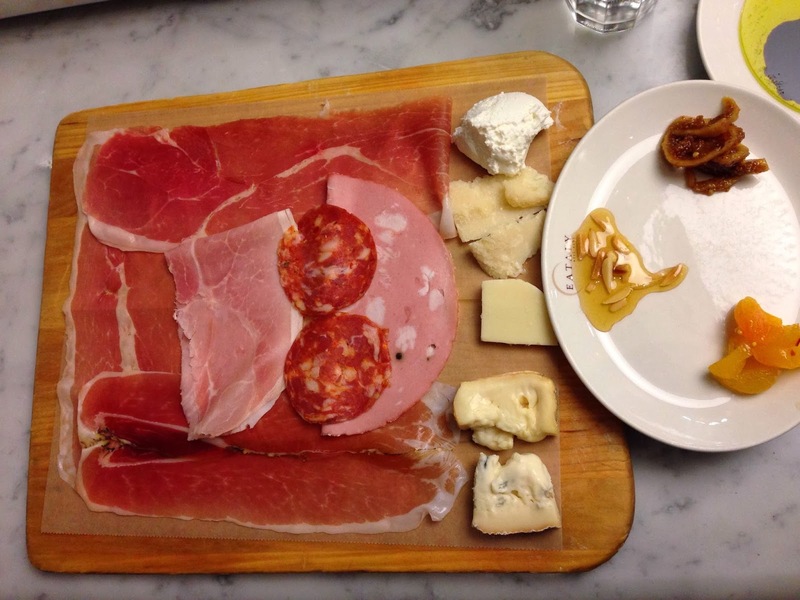 The prosciutto wasn't too dry, which seems to be a common occurrence at wine bars, and the cheeses offered were the best. The ricotta had been whipped into the lightest and fluffiest cheese. The least salty of the group, it went amazingly well with the honey and crushed almonds. Another favorite of mine was the taleggio. I tried this cheese for the first time at Whole Foods a few months ago, and for all the stinky cheese lovers out there, this is a must. Strong, creamy, and slightly nutty. Also worth mentioning-- bread and olive oil are offered at the start of the meal, and the olive oil is hands down the best I've ever had at a restaurant. Extremely strong olive tastes, and just delicious with the in-house made bread. Make sure to ask for more if you run out!